To read the tragic account of one of the estimated 20 young Somalis recruited away from Minneapolis for al-Shabaab, click here. As the new year begins, al-Shabaab, a terror group fighting to overthrow the government of Somalia, has served notice that it intends to play an increasingly prominent role in international jihad. Al-Shabaab fighters declared their support for Al Qaeda in Yemen following the attempted Christmas Day bombing of Northwest Flight 253, allegedly by a terrorist linked to that group. And police in Denmark said a man charged with the attempted New Year's Day murder of Danish cartoonist Kurt Westergaard (who drew a controversial 2005 cartoon depicting the Prophet Mohammad) was a member of al-Shabaab with "close links" to leaders of Al Qaeda in East Africa. Al Qaeda and al-Shabaab made official their alliance in September. "It was a brave step taken by a brave Somali man; he attacked a devil who insulted our honored Prophet Mohammed," an al-Shabaab spokesman told the London Daily Telegraph. "Surely an honored Muslim brother or sister will kill that devil on the next attack." On Monday, an al-Shabaab terrorist killed seven people and wounded 11 others during a suicide bombing at a clinic near the Mogadishu airport. It appears that the group intends to carry on that fight with recruits from the United States. 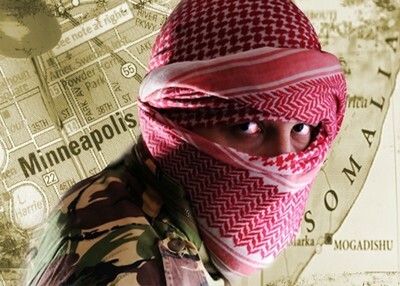 Between September 2007 and October 2009, 20 young men (all but one of Somali descent), left the Minneapolis area for Somalia to fight for al-Shabaab. Thus far, Congress and the intelligence community have been reluctant to conclude that Americans who train with al-Shabaab could return and stage terrorist attacks in the United States or threaten American interests outside the Horn of Africa. Perhaps the most detailed discussion of al-Shabaab recruiting efforts in the United States was a March 11, 2009 Senate Homeland Security and Governmental Affairs Committee hearing where Andrew Liepman of the NCTC and Philip Mudd of the FBI expressed doubt that al-Shabaab could evolve into a major threat to U.S. interests. But Mudd, associate executive assistant director of the FBI's National Security Branch, provided one significant caveat when asked how serious a problem the group is. "I would talk in terms of tens of people, which sounds small but it's significant, because every terrorist is somebody who can potentially throw a grenade into a shopping mall," he said. Mudd added that information about the number of American recruits for al-Shabaab is "fuzzy" because "[t]here are thousands of people - thousands - going to the Horn of Africa every month. You can go to Kenya to look at game parks, and it's hard for me to tell you if somebody's going to a game park or going to Shabaab. So I am sure that there are people out there that we're missing." At least six Americans have been killed after going to Somalia to join al-Shabaab. One of those was Shirwa Ahmed, who left Minnesota in December 2007. Ten months later Ahmed blew himself up, apparently becoming the first American citizen to carry out a suicide bombing. Another is Jamal Bana, 20, who in July was reported killed in Somalia. He was studying engineering at two Minneapolis schools when he disappeared in November 2008. Bana's family said it learned of his fate when a photograph of his body appeared on a website. Burhan Hassan, 17, also disappeared from his Minneapolis home in the fall of 2008 and flew to Somalia to join al-Shabaab. He, too, was shot to death in June. Read more here. At least 14 people have been charged in federal cases related to al-Shabaab recruitment in America, including attending terror training camps, fighting for - and providing support to - the group, designated a terrorist organization. The Justice Department announced the indictment of eight men alone on November 23. Four defendants have pled guilty and await sentencing. One, Abdifatah Yusuf Isse, admitted in April to training with al-Shabaab, building a terrorist training camp and learning to fire weapons. In July, Salah Osman Ahmed pled guilty to traveling to Somalia in December 2007 to fight Ethiopians. During his time fighting alongside al-Shabaab, Ahmed built a training camp and learned how to fire an AK-47. Court documents unsealed by federal prosecutors in Minneapolis on November 23, 2009 provide a detailed look at how al-Shabaab recruits and raises money in the United States. The documents examine the case of Burhan Ahmed, who was part of a group of four men who left the Minneapolis area in December 2007 to fight against Ethiopian forces that had invaded Somalia. He first went to Saudi Arabia to participate in the pilgrimage to Mecca, then joined the other three at an al-Shabaab safe house in Somalia. Between December 2007 and February 2008 the men moved "from northern Somalia to an al-Shabaab training camp in southern Somalia, staying at multiple al-Shabaab houses along the way," according to a criminal complaint by FBI Special Agent Michael Cannizzaro. "The trainees were trained by, among others, Somali, Arab, and Western instructors in, among other things, small arms, machine guns, rocket-propelled grenades, and military-style tactics. The trainees were also indoctrinated with anti-Ethiopian, anti-American, anti-Israeli, and anti-Western beliefs." Several of the Minnesota men dropped out of the program after a week or two, but Ahmed completed the entire training course. He subsequently took part in an armed ambush of Ethiopian troops. On October 29, 2008, he died in one of a series of coordinated suicide bombings that day targeting Ethiopian, Somali government and United Nations facilities in Somalia. More than 20 people were killed. Ahmed, who drove a truck into an office of the Puntland Intelligence Service, was identified by a fingerprint on a severed finger recovered at the scene. The criminal complaint alleges that Cabdulaahi Ahmed Faarax and Abdiweli Yassin Isse played key roles in recruiting for al-Shabaab. In explaining the case against Faarax and Isse, it quotes extensively from interviews with three "confidential witnesses" – individuals who have already pled guilty to conspiracy to commit murder outside the United States in connection with supporting al-Shabaab. Recruitment was accomplished through personal meetings held in the Minneapolis area, emphasizing the need for participation, and the resulting camaraderie. At one, held in an unidentified Minneapolis mosque, according to the complaint, the men called a co-conspirator in Somalia who "explained the need for CW #1 [confidential witness # 1] and his Minnesota-based co-conspirators to travel to Somalia and fight against the Ethiopians." Speaking about his own work for jihad, Faarax allegedly told another witness that he "did his part for Islam" while fighting in Somalia. But during three interviews with the FBI, he denied fighting or knowing anyone who fought in Somalia. The complaint contradicts this, alleging that during a meeting in the fall of 2007, Faarax "told his co-conspirators that he experienced true brotherhood while fighting in Somalia and that travel for jihad was the best thing that they could do." Faarax also told the co-conspirators that traveling to Somalia to fight jihad would be fun and not to be afraid. Faarax also explained to his co-conspirators that they would get to shoot guns in Somalia." Some travel to Somalia was financed by deceptively seeking funds from the community for trips to Saudi Arabia. Witnesses said they saw Isse make the claim while soliciting members of the Somali community, telling them the travel was to study the Koran in Saudi Arabia to study the Koran and not mentioning the Somali jihad. Isse and Faarax were last seen at the U.S.-Mexico border on the morning of October 8, 2009. The pair, who were dropped off by a taxicab at the San Ysidro border crossing near San Diego, carried tickets for a flight from Tijuana to Mexico City. They crossed into Mexico and their whereabouts are unknown. In a related case, the Justice Department announced in November that charging documents were unsealed against Mahamud Said Omar, who is accused of conspiring to provide financial support and personnel for al-Shabaab. Omar, who has been in custody in the Netherlands, allegedly gave money for young men to travel from Minneapolis to Somalia to fight with and train for al-Shabaab. He is believed to have "visited an Al-Shabaab safe- house and provided hundreds of dollars to fund the purchase of AK-47 rifles for men from Minneapolis." The Omar indictment alleges that he "committed and caused" nine men to leave Minnesota for Somalia to fight for al-Shabaab. Of that group, "two are believed to have died in Somalia, three have returned and pled guilty to terror charges, and four are still believed to be in Somalia," Minnesota Public Radio reported. The role of local mosques in al-Shabaab recruitment is shrouded in mystery. Some relatives of the missing men - among them Osman Ahmed of Minneapolis, whose nephew Burhan Hassan was killed in Somalia in early June - contend that the youths were radicalized at the Abubakar as-Saddique mosque in Minneapolis. They point to the fact that many of the young men who went to fight for al-Shabaab attended the mosque, among them his nephew and Shirwa Ahmed. As noted above, the criminal complaint against Isse and Faarax alleges that a jihadist recruiter called a co-conspirator in Somalia from a Minneapolis mosque, but does not name the mosque. Officials at the Abubakar mosque deny any involvement and say they oppose anyone going to Somalia to fight. Authorities believe one al-Shabaab recruiter was Zakaria Maruf, a charismatic former Minneapolis resident who is thought to have gone to Somalia to fight for al-Shabaab and has worked as a recruiter. Maruf was indicted in August for supporting the group. Al-Shabaab recruitment appears to be growing in Canada, too. Five Somali men in their mid-20s disappeared from the Toronto area between September and November, spurring anxiety among Somali Canadians and triggering investigations by authorities. The first to leave the country was 22-year-old Ahmed Elmi, who vanished in early September. He called his parents a month later to say he was in Kismayo - a Somali city controlled by al-Shabaab. Canadian officials have expressed concern that 20 or more people may have left the country to join al-Shabaab. "This is a potential menace," said David Harris, former chief of strategic planning for the Canadian Security Intelligence Service (CSIS). Harris told the Investigative Project on Terrorism that departures to Somalia could turn into "a developing and metastasizing threat" that could prove dangerous on both sides of the border. "No one should take comfort from the fact that it is five or six or 20" who have gone to Somalia, he said. "It could easily be 200 or more in the near future" and "it is just a matter of time" before someone who went abroad comes back to North America in an effort to carry out an attack. Royal Canadian Mounted Police (RCMP) Commissioner William Elliott apparently agrees. In a speech last October, he said his agency is concerned about Canadians who travel to Somalia "to fight and then return, imbued with both extremist ideology and the skills necessary to translate that into direct action." In a January 6 interview with Ottawa radio station CFRA, Harris noted there are "clear indications" that "there are transportation networks in America that would take kids to Somalia where they are impressed into service by al-Shabaab. There is no reason to imagine that the Ottawa community would be immune from this, and it would seem to me very much in the interest of Somali-Canadians of good faith to cooperate with the authorities." Though there have been complaints among some Somali Canadians that the CSIS has been unfairly targeting them, Harris says investigations have been far from excessively intrusive. Canadian security services "are effectively handcuffed in doing their job" when it comes to investigating jihadist activities. Canadian intelligence has been weakened by a series of investigations into alleged human rights abuses that have had "an unbelievably chilling effect on the intelligence services." Canadian intelligence officials now have to ask themselves whether aggressively investigating potential threats is worth "spending the next five to 20 years in court" dealing with government inquiries. This situation means "the enemy has achieved a massive victory." Terrorism experts on both sides of the border point to Abu Mansour al-Amriki, an American al-Shabaab operative who has lived in the U.S. and Canada. Amriki, a 25-year-old native of Mobile, Alabama, was born Omar Hammami. He grew up as a Baptist before converting to Islam and becoming president of the Muslim Students Association at the University of South Alabama at the time of the September 11 attacks. "Everyone was really shocked," he told an interviewer at the time. "Even now it's difficult to believe a Muslim could have done this." Hammami warned about the possibility of misguided retribution against Muslims. Hammami dropped out of school in 2002 and went to Toronto two years later. He stayed for a little over a year and made it to Somalia in 2005. He has since become one of al-Shabaab's top commanders and a fixture on recruiting videos like this, in which he denounces human rights and democracy for being at war with Muslim traditions such as stoning and cutting off hands. Militant Islamists regard the West as "Al-Harb, the land of war," Harris says. "There's…a lack of respect, a profound view that we are a happy, effete civilization. And we are proving it – by allowing them to recruit, we reinforce this stereotype. We reinforce the growing impression among Somalis that the Shabaab writ runs in our backyard, not the democratic governments of the United States and Canada." CAIR really needs to step up and do something this witness protection program thingy needs to stop and Al-Shabaab needs to be STOPPED! Excellent investigative journalism.great piece of writing is intended to make people think.. Thanks.